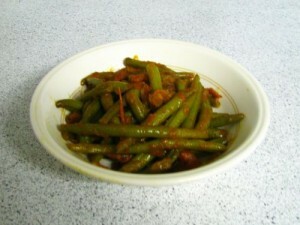 Green Beans Sabzi recipe by Anna at DesiRecipes.com. Cut beans in smalls pieces , they should be equal to four cups after cutting. Finely Chop Onions. Heat oil in a karahi and fry the onions till golden , add beans and salt , chilli and haldi to taste, pour enough water to cover the beans completely and cook for half an hour or till done on medium heat. Once beans are cooked dry the remaining water on high heat till oil seperates. Serve with fresh roti and plain yogurt. tried it. simple, quick and easy. lovely. thanks!